The latest round of a-n’s Go and see bursary scheme has awarded ten UK artists’ initiatives a total of £4,887, with sums ranging from £300-£500. Chosen from 21 applications, the awardees come from across the country and include a not-for-profit studio provider in Scotland and an artist network based in Cornwall. The bursaries will enable research trips to other artists’ initiatives across the UK, with Glasgow and Bristol being particularly popular cities to visit. The aim of the scheme is to facilitate the sharing of knowledge, improve communications and foster joint developments. a-n blogger Andrew Martyn Sugars applied on behalf of Corridor Arts, an artist-led initiative in Derbyshire; it is aiming to build a creative community in the Amber Valley district and to develop the Belper Art Trail project. The £496 award enables a visit to another artists’ initiative with more experience of running outdoor art projects with community groups. Artist Cat Bagg, who applied on behalf of CMR, which has a dedicated space for projects, workshops and exhibitions in Redruth, will use the £450 award to visit Temporary Arts Project (TAP) in Southend on Sea. 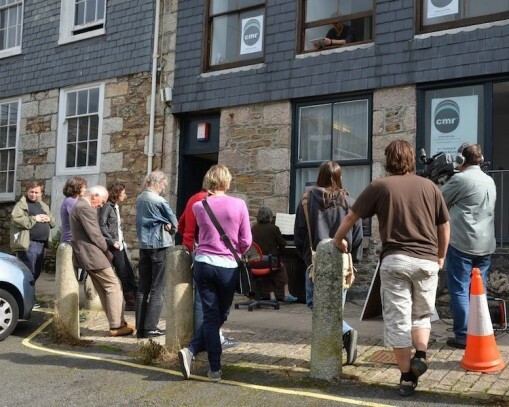 Originally founded in the 1990s as Cornwall Media Resource, CMR 2012 has been re-envisioned as an active artist network providing ad-hoc opportunities for training, collaboration and exhibiting. Glasgow and Bristol have been highlighted in this funding round, with two successful applications from each city. Both cities are also popular destinations for others to visit. Based in Glasgow’s Merchant City district, MANY, which currently provides 33 studio spaces to over 50 artists and also supports a Graduate Residency Programme, will use its award to visit artist-led projects across the UK, in order to generate discussion around how to best develop its studio facilities and community resource. The Telfer Gallery, which is currently hosted by MANY, is relocating to a new custom-designed space in the city’s East End as part of the legacy of the Glasgow 2014 Commonwealth Games. The bursary enables a visit to the Bristol Art Weekender in May, to gain knowledge from the variety of artist-led activities involved in the project. Bristol-based DFW, a collaborative group of artists connected through a shared interest in dowsing for water, will use its award to complete a short residency at Kurt Schwitters’ Merz Barn in Cumbria. Group members Amy Hancock-Martin, Azusa Chareteau, Alice Vandeleur-Boorer and Laurie Lax will develop ideas “away from everyday distractions” in the run-up to taking part in the Bristol Biennial in September. Revolve:R is a collaborative project that works with artists, writers and curators throughout Europe, Africa and USA to publish hand-made limited edition bookworks and giclee prints. A bursary to Bristol-based project co-curator Sam Treadaway will enable development with members in other UK cities including Glasgow, and opportunities to meet with other UK artist-led organisations. Others planning to visit Glasgow include: Tim Dixon from London-based curatorial project Open File, whose visits include The Common Guild, Transmission Gallery and Glue Factory; Lincolnshire-based Poly-Technic (Kate Genever), who will meet organisations and researchers including CCA director Francis McKee while also visiting Cardiff and Hertfordshire to develop mentoring, residency and commissioning programmes; and London-based Karl England from Sluice, who will visit galleries and projects in Glasgow, Newcastle upon Tyne, Edinburgh, Leeds and Belfast as part of plans for the 2015 Sluice art fair. One of England’s visits is to Newcastle-based The NewBridge Project, also in receipt of an award. This artist-led community, comprised of more than 80 artist studios, an exhibition space and bookshop, will use its award to enable members including Charlotte Gregory to visit London-based artist-led initiatives such as Studio Voltaire, Vulpes Vulpes and Cell Project Space. The next round of bursaries will be offered during May, and a-n is keen to expand the scheme by developing partnerships. “We invite all arts organisations who want to do more to support artists to sponsor some awards in the next round of bursaries,” said a-n’s Director. The a-n bursaries programme, which also includes the Re:view and New Collaborations strands, has awarded over £68,000 to 94 artists over the last 12 months. Bursaries are an important part of a-n’s professional development programme along with Airtime information and networking sessions, the granted seminar programme, and online toolkits and expert practical guides. Bursaries are open exclusively to a-n Artist + AIR members – for full details of other benefits, including access to £5m Public and Product Liability insurance, see our Join in section.